Two puzzles that the Interwebs may be able to solve for me: I'm looking for Delta flight tracking maps and wondering when the winter rush for Mexican bus travel ends. My daughters and their mom are about to take a long-awaited trip to India. 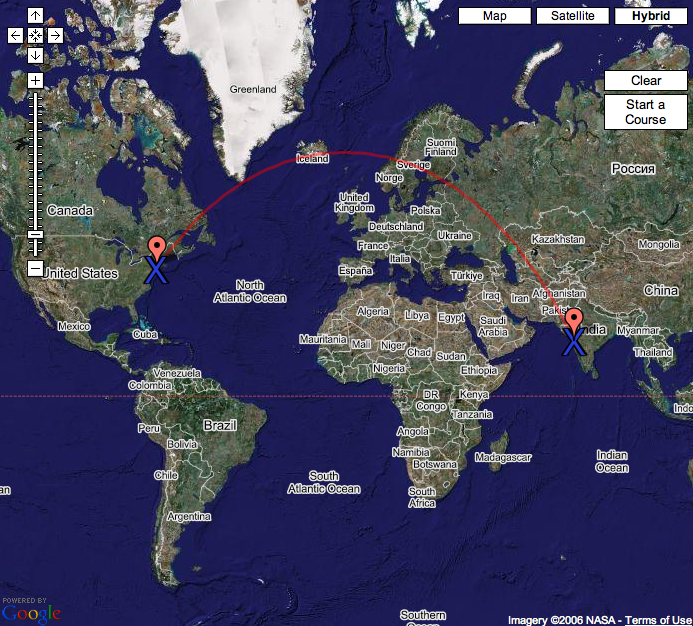 They will be on Delta's new direct flight from JFK to Mumbai using what the airline says is a polar route. The girls want a route map for their scrapbooks but to my surprise, I can't find one on the Delta site or anywhere else I've looked. The best I've been able to come up with is a couple of tools to generate generic great-circle maps. They show the route as grazing Greenland, going over Iceland, Scandinavia, western Russia, Kazakhstan, Afghanistan, and Pakistan. Pretty cool! 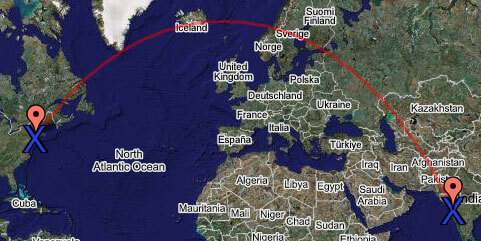 But of course the actual route might vary considerably from the idealized great circle. And is Iceland far enough north to be called "polar"? Tinkering with the ACSCDG tool I see that shifting the route a few degrees east to avoid Afghanistan would also shift it further north into the Arctic. As for me, I'm thinking about using this break to take another short bus trip to Mexico but I'd like to time it for after the end of the holiday rush. Presumably the southbound traffic has already peaked. But what about northbound? Does it happen in time for people to return to work January 2nd or so, or does it last longer, maybe up till school starts again mid-January? Anybody have any ideas?